Wisconsin's prodigal governor prior to running for President. This comic would later be published in Riverwest Currents. Counter-Productive was carried by the Badger Herald for five years. Copies of the books we published. Review of our third book that appeared in the Shepherd Express. Political cartoon picked up by GO! Magazine. In the artist's alley the the Chicago Comic Con. Counter-Productive started out as a little experiment in sequential art at the University of Wisconsin, Madison. 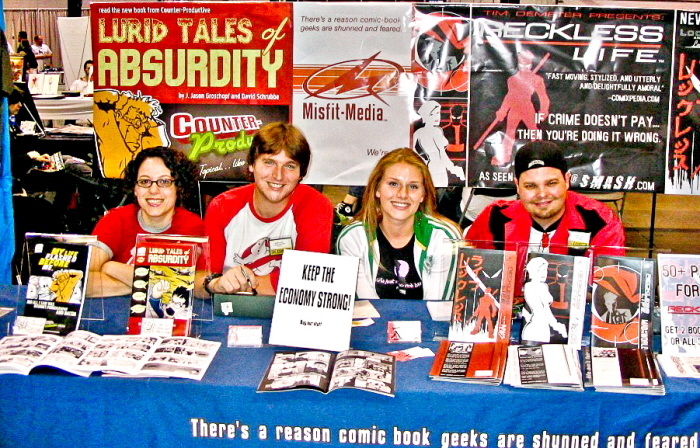 The comic was very much an illustrated sitcom, with characters based on a few of my close friends. I somehow managed to convince then comics editor Davy Mayer to pick the strip up publication five days a week in the Badger Herald. At first, I did everything by hand -- characters, backdrops, word bubbles and lettering. When this proved to be inefficient, I switched to using the computer labs at the university to do lay out. Much of my Illustrator, Photoshop and InDesign knowledge came from those early day messing around with the program to see what I could do. I'd later merge character foregrounds with Photoshopped backgrounds to create unique visual mash-up of cartoony and surreal. I illustrated everything, took photos for background and did the layout. My friend David Schrubbe came on board after the first semester of strips to co-write the comic -- an excellent turn of fortunate, considering how brilliant and funny the man is. Much of the strip's success came from this man's writing. The strip ran in the Herald from 2001 through 2006. During that time, we also published three books compiling strips, found space for the comic in the Advance-Titan and hawked our books in the artist alley at the Chicago Comic Con. After the regular schedule of comics ceased in university towns, the strip would go on to appear with it's more political content in a few zines, gallery shows, Riverwest Currents and a little bit of space in Milwaukee's newsweekly, the Shepherd Express. Our "brand", so to speak, would later branch out into other comics, such as "Check-Point" in Vital Source Magazine and "Cramer's Proxy" in the Currents. CP-Comics is more or less dormant these days. I'd like to turn my sights on a different illustrated endeavor. Still, I'm very much grateful for the experience, memories, fun and micro-celebrity status bestowed upon us during those years. Comic strips are very much a medium stifled by their adherence to the dying print media, but we sure as hell made the most of our lives with them.